"This is my puppy, Buckshot. 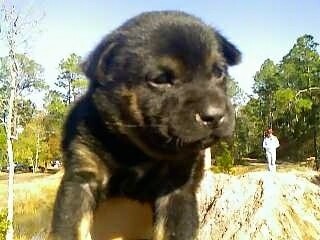 Buckshot is a 5-week-old Rottweiler / Shar Pei mix, or at least so we think. My boyfriend found him in the back of his shop at work, where he had been abandoned or left behind by his mother and the rest of the litter. My boyfriend and his fellow co-workers waited all day for the puppy's mother to come back for him but when it came time to go home she was nowhere to be seen. Instead of leaving him to freeze another night in the rain he decided to take the puppy home and surprise me with him. When he got into my arms that first night Buckshot was in terrible shape; he was severely underweight, flea-ridden and caked in mud. 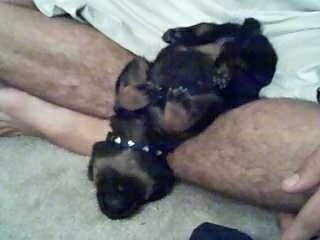 I gave him a warm bath, filled a bowl with warm puppy milk, and rocked him to sleep. Already he was looking better and he slept contently with a full belly. 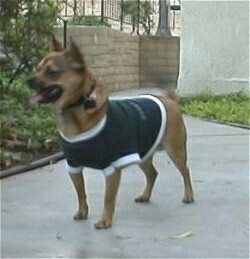 However, later on after I put him down in his crate he cried and cried and cried some more looking for mom. I've had Buckshot for a little over a week now and he's living a wonderful normal puppy life. He's started sleeping longer through the night, my other dog Heather is his new best friend, he is flea-free (thank God, I don't think I could handle one more flea bite myself), and the vet says he is perfectly healthy." "In the little time I've cared for Buckshot I've learned so much about him and myself. For one, he loves the dirt bike track. I was afraid the loud bikes would scare him but he was perfectly content playing around the yard there and exploring the woods (even though the woods are a bit difficult to maneuver being such a small puppy). As for myself, I've discovered how patient and tolerant of a mother I will make some day. My boyfriend gets a little irritated when Buckshot cries at night but I am more than happy to jump up and take him outside, which surprised me. But how couldn't I, he's my new baby and I absolutely adore him! He's a good dog though, for the most part. He's very dominant, but that's nothing I can’t handle. I've already started teaching to Sit, Stay, Come, and he walks very nicely with me when it’s time to go out and exercise." 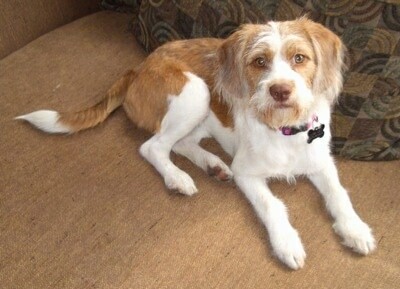 Izzy at 1 year old, weighing 23 pounds—"I submitted Izzy’s DNA to MetaMorphix, Inc. to be tested. They only have about 40 dog breeds in their DNA database so they weren’t able to determine her primary heritage but they did figure out her secondary DNA was Beagle and she also had DNA (although a small amount) of a St. Bernard. Also interesting is Bassett Hound and Shih-Tzu were in the DNA pool and no DNA from those two dogs was part of Izzy’s DNA." 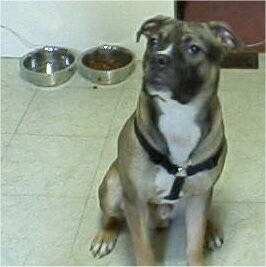 Archie, Boxer / Pit Bull mix, rescued from the Delaware County SPCA. 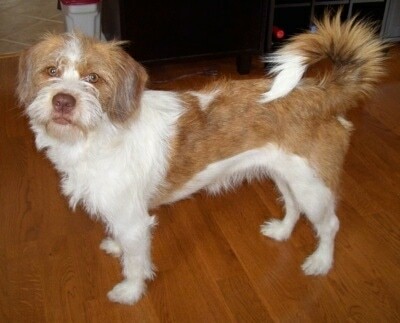 He has a lot of energy but is very loveable. 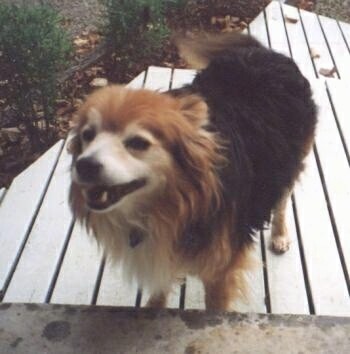 Sparky was an Australian Terrier / Border Collie mix. He lived to be 16 ½ years old. This is Bud. 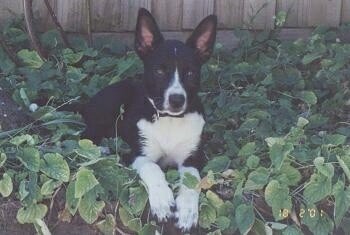 He is an 18-month-old Kelpie / Blue Heeler cross. 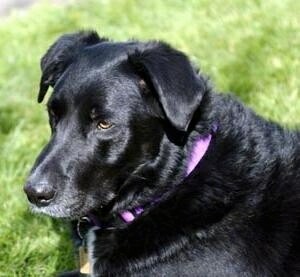 Kenny is a Lab / Collie mix (we think).